Libby Lane, the first woman bishop in the Church of England, was consecrated on 26 January. You can watch highlights of the service from York Minster on the BBC website. Junior Church now has a new group for families with children from birth to six years in addition to the regular group for school-age children. ‘Family Sing and Pray' is for children with a parent or caregiver and takes place during the Sunday service in the school near the church. Through developmentally appropriate activities, music and movement, Junior Church leaders introduce beginning scriptural concepts and prayer in a way that is fun for the children and encourages family bonding and fellowship. At the end of the lesson we return to the Church to join in communion with the congregation. Please come join us with your little ones! If you made a donation to the Anglican Church of St Thomas Becket in 2014, are not on the church electoral role and require a receipt for tax purposes, please let us have your postal address. Please send details by e-mail to info (at) anglican-church-hamburg.de or by post to The Treasurer, Anglican Church of St Thomas Becket, Englische Planke 1A, 20459 Hamburg. Cicely will long be remembered as one of the kindest, most active, serious, and thoughtful, also most knowledgeable, members of the congregation in recent decades. In every respect, she possessed a tough constitution. As late as September last year, she was leading a country walk for the Church Wanderers, whom she led and ran for many years. Cicely and her husband Geoffrey, a retired naval officer and keen cyclist, first came to Hamburg in 1978, when he joined the frigate sales unit of Blohm & Voss shipyard. Cicely was a graduate in French and German of St. Andrew’s University. During Geoffrey’s naval career they had lived in both Oberammergau and Toulon, and had a daughter and a son, Lesley and Robert. Of the three grandchildren, Cicely was especially pleased to see Anna graduate at Cambridge last summer. 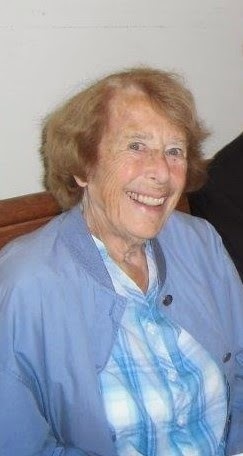 After Geoffrey’s early death in 1995, Cicely was elected People’s Warden, and as such played a central part in the life of the church on into the 21st century. For years she was one of the church delegates to the Council of Anglican and Episcopal Churches in Germany (CAECG), often staying on after the bi-annual meetings to visit the host church. Closer home, until the end she gave up a lot of her time to representing St Thomas Becket at the ACKH, or Working Group of Christian Churches in Hamburg. As one of the church’s relatively few car owners, she regularly collected supplies for its Fair Trade stall and was otherwise a pillar of the Mothers Union. She was a generous hostess, among others for the Western Hamburg House Group. Aside from all these group commitments, Cicely was an immensely thoughtful and considerate friend to people of a wide variety of ages and backgrounds. She was invariably generous with her time, a good listener, especially for people with problems. She tended to shun frivolity, but participated actively in the life of several English-speaking associations in Hamburg. She did so despite having a home in England and family there and in Finland, which she visited annually for Christmas. Cicely personified the ideal of Christian service, and will be seriously missed. The next issue of Becket News is due to be published at the end of January/beginning of February. What events are you planning for the next quarter? How are your activities and groups progressing? Is there anything you'd like to promote or share? Your Becket News editor would like to know. Photographs are great, too, preferably accompanied by an informative caption or a longer article. PLEASE send your articles, event news, reports on activities and information by Friday 16 January at the latest to becketnews (at) aol.com. On Sunday 8 February, the Sunday after Candlemas, STB's own chamber choir, the Anglican Consort, will be singing choral evensong at 5pm. The music will include Thomas Tallis's beautiful anthem, O nata lux, canticles by Orlando Gibbons, and the anthem Lord now lettest thou by Mendelssohn. You can find details of all four choral evensongs planned for 2015 here. Due to the storm, the Church Wanderers walk for tomorrow, Saturday 10 January, has been cancelled. The next walk with Church Wanderers this Saturday, 10 January, will be from Rissen to Wedel, ending with the traditional New Year's lunch in the Dolce Vita restaurant in Wedel at 1.30pm. The walk will begin from Rissen S-Bahn station at about 11 am. (Catch the S1 which leaves Hamburg Hauptbahnhof at 10:19 and gets to Rissen at 10:54.) Please let Nicki Schiller know if you are coming by 4pm on Friday, 9 January – nicki.schiller [at] gmx.de, tel. 04104 695537 or 0176 30 393 063. Oliver Martinez, alias “Elvis”, is back at St Thomas Becket by popular request on Thursday, 8 January 2015 for a fun evening of songs to celebrate Elvis Presley's 80th birthday. Doors open at 7.30pm and the concert begins at 8pm (no reserved seating). There is no admission charge, but a collection in aid of the church will be taken up during the evening. Download the flier here.